Whether the production of concrete mixing plant is normal or not, the quality of concrete and the cost of material consumption are all related to the measuring system of concrete mixing plant . 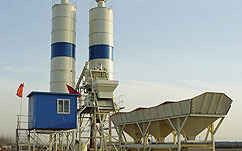 Therefore, the management of the measurement system is of great significance to the concrete mixing plant . 1. All measuring instruments, such as scales, measuring feet, test equipment and instruments, must be sent to the measuring department for checking regularly according to the requirements of the measurement method, and properly kept and maintained, and properly used, especially the theodolite, level gauge and other instruments shall be checked frequently. 2. Strict implementation of relevant provisions on measurement during construction. Reinforced concrete engineering is building and the main structure, especially should strengthen the supervision for the measurement of the steel bar, concrete construction process, must mix proportion by weight, mixing concrete and mortar to sampling observation of sand, stone, cement, water metering the original testing data, the determination of the moisture content of sand, stone, accurate control of mixing water, control the water cement ratio. 3. Check the weekly inspection of all kinds of measuring instruments in use, check whether they are missing or not, and check the three rates of measuring instruments: namely, the ratio of equipment, the rate of detection, and the rate of pass, whether they meet the standards and process requirements.